Each elephant key chain measures 1.75” x 1.5” (3.25” long with chain). 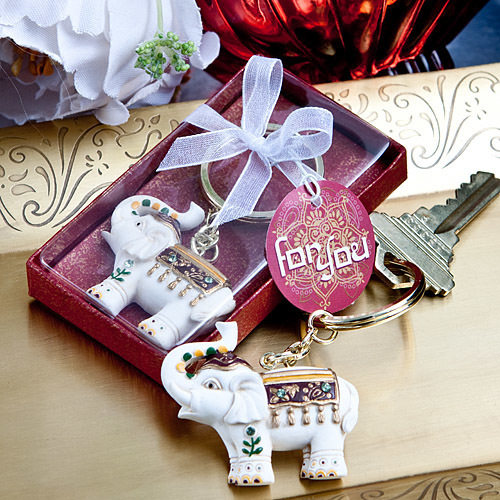 The ivory poly resin elephant charm is hand painted with intricate gold, green and brick-red details, including a decorative blanket and head covering. The elephant looks majestic and playful with his trunk held high to symbolize good luck. Charm is attached at its top to a sturdy gold metal chain and ring. Comes packaged inside a clear topped box, with a gold and red base. Box is wrapped and tied with a white organza ribbon and has an attached “For You” tag in a dramatic red and gold, Indian-inspired design.